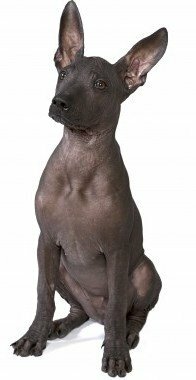 Pronounced "show-low-eats-queent-lee.” or show low for short (Xolo"
The Xoloitzcuintli, or Mexican Hairless Dog, is a very rare breed of dog that is actually considered a national treasure in Mexico. These are unique dogs, with a unique name. Even experts have trouble pronouncing the name of this dog. The way to pronounce their name is (show-low-its-queen-tli), but it is easiest to call them Mexican Hairless or simple “Xolo”, which is pronounced (show-low). If you’re in the market for a rare treasure that is loyal, alert, and athletic, then you are reading the right article. The Xolo comes in a few different sizes, much like a poodle. Standard, miniature, and toy, but for the sake of this article and website, we are going to be focusing on the toy Xoloitzcuintli. These unique dogs have a hairless body that actually radiates heat more intensely than a coated dog does. Ancient people used to use them as heating pads to help ease the aches and pains that they might be having. With this being said, on a cold winter's night if you have a Xolo cuddled up next to you, you will be warm all night. These guys have unique tall and erect ears that sort of resemble a bat if you’re looking at them straight on. It is a very strange look, and they have the sort of face that “only a mother could love”. They often win Ugliest Dog Contests or come in second to the infamous Chinese Crested. Some people do think that they are very cute though, and despite their looks they are extremely loving to their families and are overall good dogs. 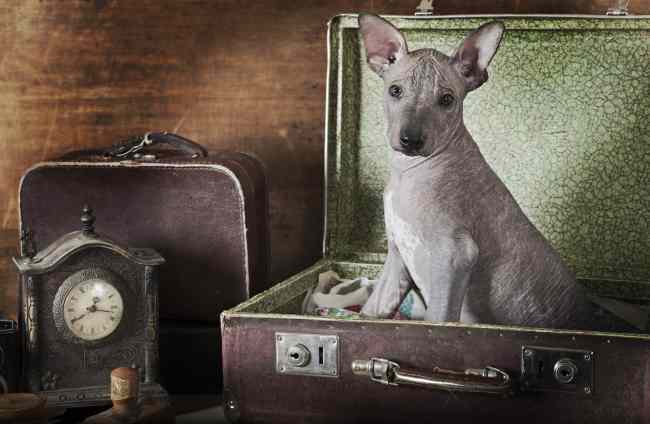 If you and your family are looking for a pup that is very intelligent and energetic along with other great characteristics, then look no further than the Mexican Hairless dog, or Xoloitzcuintli. Good with Other Pets: not ideal for families with small pets such as hamsters, rabbits, etc., and cannot be trusted alone with small pets; however, they are fine with other dogs. Xoloitzcuintli is one of several very ancient breeds. 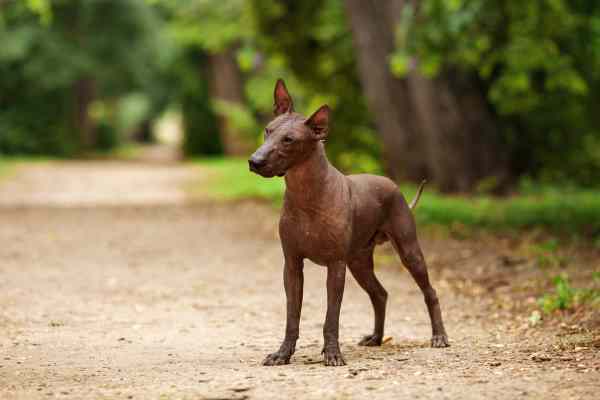 The Xoloitzcuintli is one of the most rare breeds of dog. They are also one of the oldest breeds and are more than 3000 years old, and were the first breed of the Americas. Many say that they are actually one of the oldest breeds on the planet with pre-Aztec engravings that depict a dog, which is remarkably similar to what is now the Xolo. Drawings were found on pottery, and walls of tombs. Xolos were highly praised as very loyal, intelligent and mystical. They have barely changed to this day. They were considered to be the first association between mankind and canine. The name Xoloitzcuintli comes from the Aztecs. “Xolo” means ‘god of the underworld’, and “itzcuintli” means ‘dog’. Their body actually radiates heat more intensely than dogs with hair, which appealed to the Aztecs. Ancient people used them as heating pads to help ease aches and pains. That is one of the reasons that this breed of dog was considered the holy dog, having god-like special healing powers. Xoloitzcuintli were among the first breeds to be registered by the AKC in 1887. After that, they fell out of favor with the public and nearly went extinct, and in 1959, they were removed from AKC registers. However, in 2008, several kennel clubs recognized them again. This is one of the reasons they are as rare as they are, and it’s not common to see a Mexican Hairless strolling down the streets of your local city. Luckily they are no longer in danger of becoming extinct due to lack of appeal to people. They are actually still highly praised as being therapy dogs, and excellent show dogs. These guys might not be the most popular dogs, but that makes them more of a gem to own one. The Xolo is loyal, friendly and alert, making them an excellent watch dog. The Xolo holds many excellent characteristics such as loyalty, friendliness, alertness, intelligence, and an overall loving nature. This breed can tend to be a bit aloof and protective with strangers, but they are completely dedicated to their family. It is necessary that all family members are present to assist with training and socialization. All members of the family need to help with training, feeding, housebreaking, etc. If not, they might just bond to the one family member that trains them and be aloof with the rest of the family. This is a missed opportunity because Xoloitzcuintlis are extremely good family dogs. They are sometimes referred to as “Velcro dogs” because they will stick by their owner’s side and follow them around. Xolos are not known to run off or leave their home. They will climb fences or break through gates to be where you are. However, they are smart enough to stay where you tell them to for a definite period of time. They will not stay put forever. This is not a breed that will be all loving with babies and toddlers, so that needs to be kept in mind when choosing your companion. Of course with proper socialization and training from a young age, they can adapt to living with small children, but do a little better with older children who know how to handle them. This particular breed has been known to suffer from Small Dog Syndrome. This is where the dog decides that they are the alpha dog of the family and try to order the humans around. 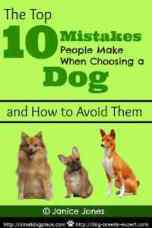 This can cause many behavioral issues and needs to be avoided with any dog at all cost. It is vital that you do not treat the dog like a human. Xolos can be known to be very sensitive, so it is essential to not physically or verbally reprimand the dog, which includes yelling and hitting. They require firmness and kindness to have a successfully trained Xolo. However, with early and proper training, they are good dogs to have around. Fortunately, they are also pretty easy to train, and you should not have many problems while doing so. This is a breed that is becoming very popular in agility, therapy, and obedience. The typical Xoloitzcuintli temperament is very calm and tranquil, and they don’t bark often which is great for apartment dwellers or people with close neighbors. Xolos also make wonderful companions for elderly people due to their body heat acting as a heating pad. They are very low-key and calm and do not need an excessive amount of exercise. They do need their daily walks. Mexican Hairless dogs have a natural instinct to walk and need daily walks to fulfill this. Dogs that get less time to walk will most likely display some behavioral issues. Letting them run around and play will fulfill some of their exercise needs, but not their need to walk. As most hairless breeds, they prefer warmer climates and need to be protected from the severe cold. When it comes to temperature, treat them as you would yourself. If it is too cold or too hot for you, it is too cold or hot for your Xolo. Do not leave them outside in extreme weather. On a nice sunny day though, you can find your Xolo sunbathing and laying in the sun. Many owners prefer to paper or litter train their pup, so they do not need to go outside in extreme cold. They are pretty adaptable and can adapt to many lifestyles, but if you live somewhere where it gets extremely cold then this may not be the breed for you. A sweater or jacket is recommended during the cold months of the year. Xolos do crate train fairly well and actually enjoy a place for themselves for a little while during the day or at night when they can’t be by your side. They are not good as outdoor dogs or kennel dogs. If you commit to a Xolo then you commit to a sidekick at all times. Do not leave your pup outside by itself; they are considered an indoor breed. Another plus about owning a Xolo is that they are fairly quiet and do not excessively bark. With this being said, when they do bark or make noise, they are trying to get your attention and tell you something, and you will want to listen to them. Grooming is obviously minimal for a hairless dog, but they do need to have their skin taken care of. Like a humans, they need sunscreen when they go outside. They also need to be occasionally bathed, exfoliated, and moisturized. Using baby products or products for gentle skin is recommended. However, do not wash or moisturize too often because it can clog the dog’s pores, or strip their skin of the natural oils, which would not be safe. They only need to be bathed and lotion applied about once or twice a month, or as needed. When it comes to grooming, maintain their skin as you would maintain your own. 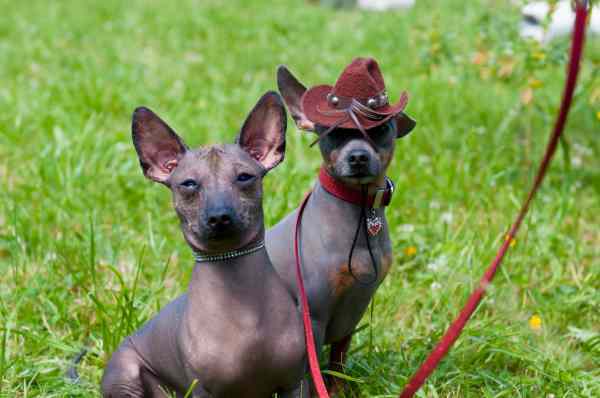 Xoloitzcuintli is the only breed of dog that starts with the letter X? The hairless trait in this breed is actually recessive, so about every one fifth of a Xolo litter will have hair. If you have a coated Xoloitzcuintli then they need weekly brushing and regular bathing as any typical coated dog would. Even the coated Xolo has very little shedding which makes them perfect for people who suffer from allergies. 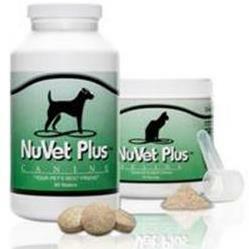 Both types will also require regular visits to the vet, regular teeth brushing and nail clipping, etc. This breed can have a few health issues such as food allergies and missing teeth, but the main problem for them is skin concerns. They can suffer from acne and bumps on the skin. Regularly check your Xolo for bumps or pigmentation on the skin. Talk to your vet if you notice any differences in your pup’s skin. Other than that they are considered a healthy breed due to the many years for disease to be bred out.